I always think that the ultimate test of a skincare range is to try their cleanser and toner products - the kind of product you use every day and from which you expect results. There is nowhere to hide when you make a daily cleanser and toner! Which is exactly why, when asked to trial the Nurture Cosmetics skincare range, I chose to sample the cleanser, toner and daily moisturisers. 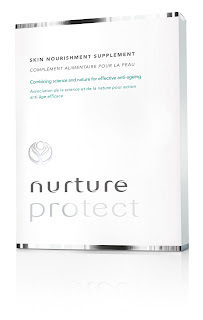 Nurture Cosmetics focus on two different ranges - the 'Protect' range that I tried is suitable for protecting younger skin from the signs of ageing, particularly UV damage. The 'Replenish' range is formulated specifically for women experiencing the menopause. I really like the Nurture approach to skincare - it is one very much aligned to my own skincare approach. Science for effectiveness of the product and research into the clinically proven effects of the products... and then Nature for the guidance of the ingredients to use. All of the products in the Nurture protect range are hypoallergenic (so suitable for sensitive skin) and free from fragrance, colours and artificial preservatives. I must say that having a fragrance free cleanser and toner is quite unusual for me and I did miss a floral summery feeling when applying them but there were no chemically smells so there was no scent that needed disguising! 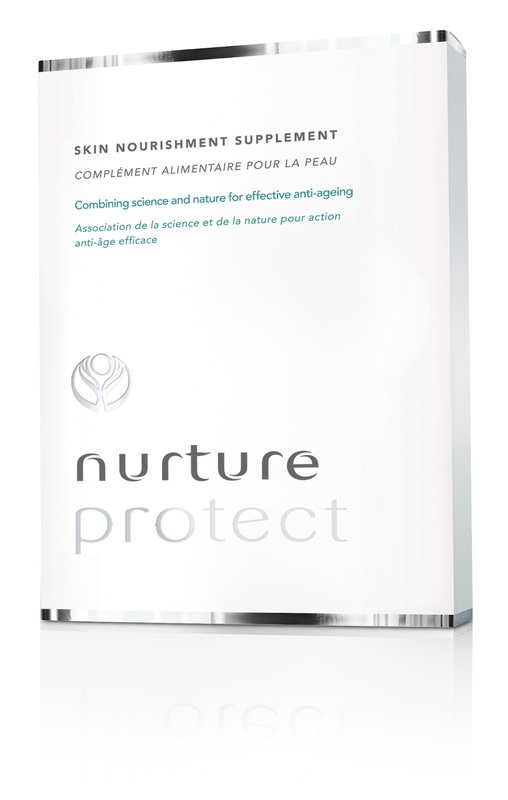 Nurture skincare products are complimented by a food supplement designed to repair and protect your skin from the inside as well as using the products on the outside. I'll admit that I haven't yet tried the supplement as I am breastfeeding at present and already taking a breastfeeding supplement and didn't want to risk taking anything that might interfere. I REALLY enjoyed using the Nurture Protect Soothing Cream Cleanser and Gentle Toner. The products are so simple, hassle free and no-nonsense. They do exactly what I need them to do. Keep my skin clean every day. At less than £5 each they are also very good value. I tried both the Protect Night Cream and SPF15 Protect Day Cream. The day cream is ever so slightly lighter in texture but they were both very similar. Both moisturisers came in a very annoying pump bottle that I found hard to depress and which resulted in a splat of lotion on my hands and I was never quite sure what direction it would go in! I was disappointed with the Night Cream as I didn't feel wonderful when I woke up in the morning (something I have come to expect from a night cream) but the day cream was nice to use, if not noticeably effective. At just under £11 each I still think they are a good value moisturiser that won't break the bank. Nurture cosmetics can be bought online at www.nurtureskincare.co.uk. Follow us on our Summer Road Trip! Am I Still THE Mellow Mummy?